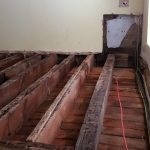 During the course of renovation works to a property in Buckinghamshire, woodworm was found to be affecting various timbers within the property. Kenwood were called in to asses and provide a quotation to treat the affected timber. 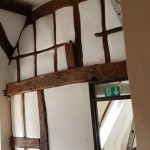 This building was built in the 1600’s and still holds many beautiful period features, such as embedded bonding timbers. Timbers throughout the property required treatment with Kenwood insecticidal timber preservative. A number of building works are being carried out within the property by various contractors whom Kenwood worked with to complete works. With our preservative spray having a re-entry time of as little as just 1 hour after application, very little disruption was caused. With the peace of mind that comes with a Kenwood twenty year written guarantee, the owners can complete there renovations.